Fortune House in the Brickell area of Miami was completed in 1998 and is a property designed by architect firm Bermello, Ajamil and Partners. It is 29 stories high and contains 296 one to two bedroom condominiums between 600 and 950 square feet. It is a full service building with resort style amenities in the middle of the city. 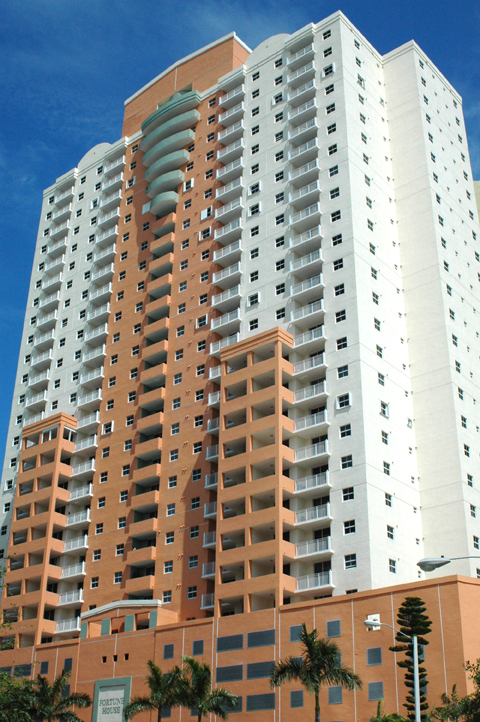 Fortune House has stunning views of the Miami skyline and is easily distinguishable by its art deco colors. Some of the property’s amenities include a business center, fully equipped fitness center with lockers and steam and sauna, weekly maid service, 24 hour security, concierge, deli, laundry service, and outdoor heated pool with bay views. Residences are appointed with top of the line appliances and finishes and are spacious. 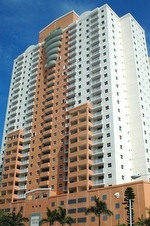 Located in the financial district of Brickell, Fortune House is centrally located to all that Miami has to offer. It is just a short drive to the beach, either South Beach or Key Biscayne, and a short trip on the metro rail to downtown, it is a convenient location for work or pleasure. There are a number of marinas nearby for those who enjoy nautical pursuits and the Miami International Airport is just a 15 minute drive. Mary Brickell Village is the center of Brickell and has a number of dining options from casual to gourmet and the nightlife is lively. Brickell is home to professionals and families alike and offers a pedestrian friendly lifestyle in the heart of the city.